Resides in Bayamon, PR during the offseason...Participated in the pre-game ceremony prior to the ¡Fiesta Tigres! game and attended the Tigers Winter Caravan and TigerFest ...Recommended/signed by Rolando Casanova and German Geigel for the Tigers. Saw the first Major League action of his career in 2017, making 24 appearances for the Tigers...Made his Major League debut on April 13 vs. Minnesota, throwing a scoreless inning with one strikeout...struck out Byron Buxton for his first Major League strikeout... Sidelined from May 5-June 15 with a lumbar spine strain...Threw 17.0 consecutive scoreless innings with Triple A Toledo from June 25-July 28...during the streak, he struck out 20 batters, while only allowing nine hits in 16 games...Appeared in four games with Team Puerto Rico in the World Baseball Classic and had a 0.00 ERA (3.0IP/0ER) with two strikeouts. July 31, 2017 Detroit Tigers recalled RHP Joe Jimenez from Toledo Mud Hens. June 17, 2017 RHP Joe Jimenez assigned to Toledo Mud Hens from Lakeland Flying Tigers. June 15, 2017 RHP Joe Jimenez assigned to Lakeland Flying Tigers from Toledo Mud Hens. May 9, 2017 Toledo Mud Hens placed RHP Joe Jimenez on the 7-day disabled list retroactive to May 5, 2017. May 1, 2017 Detroit Tigers optioned RHP Joe Jimenez to Toledo Mud Hens. April 21, 2017 Detroit Tigers recalled Joe Jimenez from Toledo Mud Hens. April 14, 2017 Detroit Tigers optioned RHP Joe Jimenez to Toledo Mud Hens. April 10, 2017 Detroit Tigers selected the contract of RHP Joe Jimenez from Toledo Mud Hens. April 10, 2017 Detroit Tigers activated RHP Joe Jimenez. 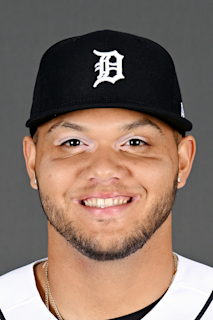 January 11, 2017 Detroit Tigers invited non-roster RHP Joe Jimenez to spring training. July 29, 2016 RHP Joe Jimenez assigned to Toledo Mud Hens from Erie SeaWolves. May 27, 2016 RHP Joe Jimenez assigned to Erie SeaWolves from Lakeland Flying Tigers. April 2, 2016 RHP Joe Jimenez assigned to Lakeland Flying Tigers from West Michigan Whitecaps. January 14, 2016 Detroit Tigers invited non-roster RHP Joe Jimenez to spring training. April 25, 2015 West Michigan Whitecaps activated RHP Joe Jimenez from the 7-day disabled list. April 20, 2015 West Michigan Whitecaps placed RHP Joe Jimenez on the 7-day disabled list. April 4, 2015 RHP Joe Jimenez assigned to West Michigan Whitecaps from Connecticut Tigers. May 24, 2014 RHP Joe Jimenez assigned to Lakeland Flying Tigers from GCL Tigers. November 2, 2013 RHP Joe Jimenez assigned to Gigantes de Carolina. November 2, 2013 Gigantes de Carolina placed RHP Joe Jimenez on the reserve list. November 2, 2013 Gigantes de Carolina activated RHP Joe Jimenez. June 25, 2013 RHP Joe Jimenez assigned to GCL Tigers. June 24, 2013 Detroit Tigers signed free agent RHP Joe Jimenez to a minor league contract.